Reel Talk Online: First Look: "How Do You Know?" 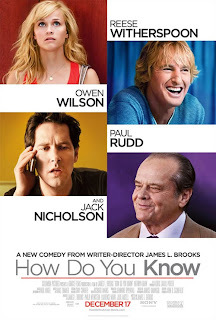 First Look: "How Do You Know?" Reese Witherspoon goes back to her roots with another lame romantic comedy, How Do You Know. The Oscar winner plays a professional softball player who must choose between two goofballs (played by Paul Rudd and Owen Wilson) who accidentally find out that they are in love with her after much self-deliberation. There's not much else to this snooze of a flick it seems. Check out the trailer below (Try not to mind the random and misused talent of Jack Nicholson). How Do You Know charges into theaters December 17. These kind of movies give chick flicks a bad name. Reese is too good an actress for this. This is a shame. I was hoping the coupling of Rudd and Witherspoon would produce rom-com gold. Looks like it doesn't work out that way.